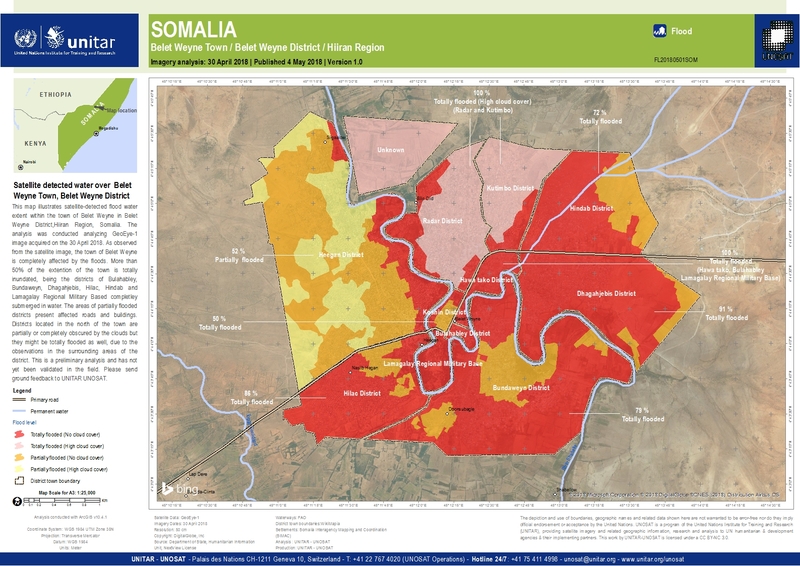 This map illustrates satellite-detected flood water extent within the town of Belet Weyne in Belet Weyne District,Hiiran Region, Somalia. The analysis was conducted analyzing GeoEye-1 image acquired on the 30 April 2018. As observed from the satellite image, the town of Belet Weyne is completely affected by the floods. More than 50% of the extension of the town is totally inundated, being the districts of Bulahabley, Bundaweyn, Dhagahjebis, Hilac, Hindab and Lamagalay Regional Military Based completely submerged in water. The areas of partially flooded districts present affected roads and buildings. Districts located in the north of the town are partially or completely obscured by the clouds but they might be totally flooded as well, due to the observations in the surrounding areas of the district. This is a preliminary analysis and has not yet been validated in the field. Please send ground feedback to UNITAR UNOSAT.